One common denominator between Donald Trump and the French ultra-right presidential candidate, Marine Le Pen, is their opposition to globalization. 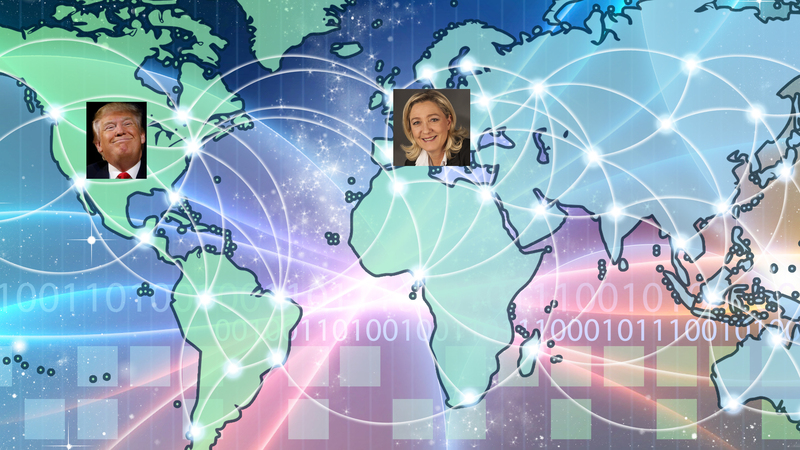 Unfortunately for Trump and Le Pen, globalization is not reversible as information and communications technology (ICT) is transforming the world into one global village. Policy makers in almost every country have come to the realization that investment in ICT infrastructure triggers economic growth and enables e-trade within nations and across borders. According to a Huawei Global Connectivity Index (GCI), a report that gauges nations’ status in ICT Infrastructure investment, a country that invests an additional 10% in ICT Infrastructure between 2016 and 2025, can have a multiplier effect on its GDP. Every additional US$1 invested in ICT Infrastructure could bring in a US$3 return in GDP. When countries are well connected with ICT infrastructure, professionals can easily start digital based businesses as contractors or freelancers. According to a survey, freelancing in America, 55 million people work as freelancers generating $1 Trillion for the US economy. Lawyers in one country can offer consulting services to clients in other countries on how to enter their markets, architects in the West can work with companies in Dubai designing buildings while engineers in China can direct technicians in Africa on how to design their fiber optic networks – all in the comfort of their countries. Distance education has especially been boosted by the global digital infrastructure. So many people are benefiting from educational institutions overseas without incurring the high living and travel costs. Disciplines such as engineering that require laboratory experiments are also finding their way online – thanks to the development of virtual laboratories powered by high speed Internet. Over the past decade, rapid investment in ICT infrastructure has especially been noticeable in the developing world which aspires to be an integral part to the global village. In Africa, trillions of investment dollars have gone into developing undersea fiber optic cables that connect African countries to one another and to the rest of world. Every country has multiple high speed access, metropolitan or national backbone projects connecting communities to one another and to the rest of world. The combined power of the new-found infrastructure and cloud computing is opening a lot doors. Many Africans have joined the bandwagon and taken advantage of opportunities overseas without leaving Africa. The rapid development of ICTs requires everybody to constantly keep abreast with the changes and upgrade their skills to match requirements for this new global economy – lest they get left behind. The old processes whether in coal mining, steel or other forms of manufacturing will never come back. The accelerated investment in ICT infrastructure, colocation data centers, cloud services, Big Data and the Internet of things are triggering more innovations in smart manufacturing, smart cities, artificial intelligence, nanotechnology, genomics, and robotics. All this require ever changing skills requirements. The push by Trump and Le Pen to close borders, curtail immigration and thwart free trade will never stop the digital driven globalization. They are better of pushing for training of people on how to adapt to the new digital reality.